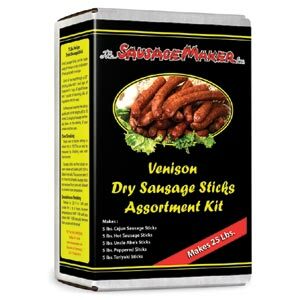 You�re viewing our Sausage Maker venison dried sausage stick assortment kit � makes 25 lbs. 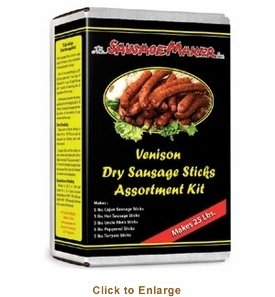 The kit includes Uncle Abe's Hot Sausage Sticks, Cajun Sausage Sticks, Pepper Sausage Sticks, and Teriyaki Sausage Sticks, along with Insta Cure #1, Liquid Smoke and 19mm Collagen Casings. Makes 25 lbs. Contains MSG. If you have questions about our products we are here to help you.